Olimp Gold Ashwagandha is a dietary supplement containing the highest quality and patented extract of Ashwagandha KSM-66, standardized on the content of bioactive substances, ie. withanolides. Ashwagandha (Withania somnifera) – itis a plant used in traditional Eastern medicine; called Indian ginseng due to its adaptogenic properties, ie. increasing the body's resistance to stress factors. In ayurveda it is regarded as a cure for rheumatism, exhaustion, sexual impotence and memory impairment. It includes a plurality of active substances, including nicotine alkaloids, beta-sitosterol, withanolides, coumarin, and chlorogenic acid. Withanolides are pharmacologically active compounds that occur naturally in the root of the plant. They exhibit sedative, anti-cancer, cytotoxic and lowering blood pressure properties. Ashwagandha is widely appreciated primarily for its ability to improve mood, anti-stress, anxiolytics, and antidepressants properties, improving adaptation to the environment, increasing self-confidence, extroversion and openness to new experiences. It owes its properties thatnk to the ability to sensitize serotonin (5-HT), whereby the same amount of serotonin, by binding to a specific receptor, is more powerful and works more efficiently, ie. increases the frequency of nerve impulses on serotonergic pathways. 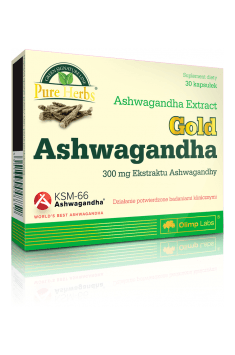 Olimp Gold Ashwagandha is a dietary supplement containing the most appreciated extract of Ashwagandha KSM-66, which is obtained in the process according to the principles of 'Green chemistry'. It has a beneficial effect on the body's energy economy and build resistance to stress factors. 1 kaps przed snem i jest lepsza regeneracja, organizm czuje sie znacznie świeższy. Za jakiś czas wypadało by badania porobić powinny być parametry polepszone cholesterol, kortyzol itp. Take 1 capsule with a meal with plenty of water. For stress reduction and mood improvement, the product is best used with the first meal. Using it in the evening, on the other hand, can improve the quality of sleep. There are no contraindications for using it every day at both times of day. Bulking agent - microcrystalline cellulose; anti-caking agents - magnesium salts of fatty acids, silicon dioxide; capsule (shell component - gelatine, food colouring - E 171).